An integral part of every home and a true expression of one’s lifestyle, wardrobes today are more than just storage solutions. Moving away from traditional designs, Grandeur offers a selection of elegant Italian wardrobes that exude luxury without a compromise on functionality. From mirrored sliding doors to vintage fittings and spacious walk-in closets, our bespoke wardrobe solutions offer ample space to store your clothes and bed linen. Fully customizable to suit your various requirements, our range of luxury wardrobes are designed to maximise your space. 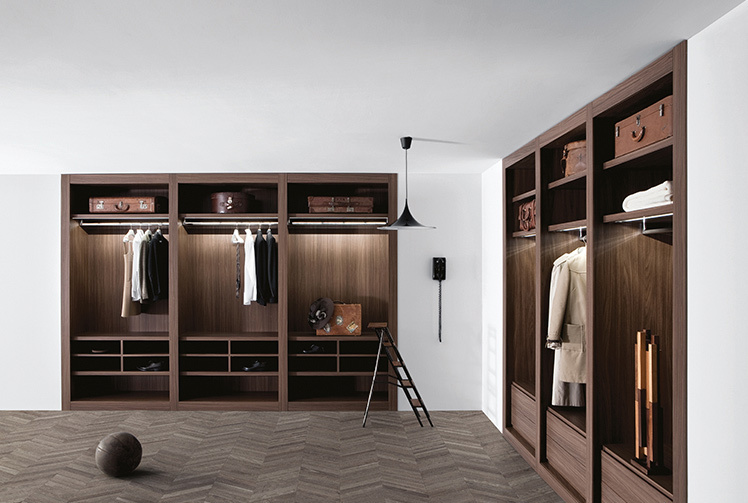 An elegant design, the Sipario by Pianca is a walk-in closet made up of modules that can be assembled to suit individual storage requirements and aesthetic preferences.‎ The frame of this wardrobe is available in an array of finishes – enhancing the arrangement to create a warm and sophisticated appeal. The modules of Sipario consist of a base, back panel and the option of one or two doors in wing, sliding or flush-sliding variations. A versatile design that boasts convenience, this wardrobe can also feature compartments with a wide-range of pull-out accessories to meet even the most demanding of requests. From pre to post-installation, our experienced and dedicated design teams are here to create premium bespoke wardrobes thoughtfully tailored to you and your home.